Industrial and distribution continues to be the strongest performing property sector in Kent and Medway, according to the Kent Property Market Report 2018. 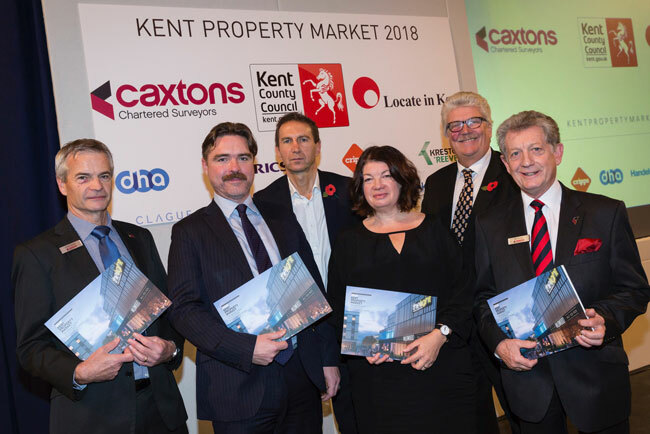 David Gurton of Caxtons, Gavin Cleary of Locate in Kent, Mark Coxon and Sue Foxley of Caxtons, Mark Dance of KCC, and Ron Roser of Caxtons at the launch of the Kent Property Market Report 2018. Produced by Caxtons Chartered Surveyors, Kent County Council and Locate in Kent, the report was launched this week. With the weakening of Sterling since the EU referendum boosting manufacturing and the gathering pace of online retail increasing demand for distribution space, prime rents in the county have risen by an average of 4.4%, twice the long run mean. Over the past five years, prime rents have increased by an average of 24% and are currently 11% ahead of the their pre-finanical crisis peak. The report records that the county has seen a number of significant lettings along with boyuant activity at the smaller end of the scale. In Ashford, Forza Industries took 2,325m2 at Axiom on Orbital Park, while in Dartford Ask took a six-year lease on 606m2 at 291 Watling Street. Looking ahead, Amazon is due to open a 34,000m2 last mile sorting centre in Medway later this year, Aldi’s new 5.67ha distribution centre in Queenborough will open in 2019, and Ocado has plans for a 1.92ha site at Littlebrook.